Kim R. McConkey is an independent researcher based in Hyderabad. She is an adjunct faculty at the National Institute of Advanced Studies, Bangalore, and an Honorary Assistant Professor at the University of Nottingham, Malaysia. Her choice of becoming an independent researcher was motivated by her desire to have a research career alongside being an ‘available’ mother to her two kids. My undergraduate degree (BSc, plus an honours year) was done at Victoria University of Wellington, New Zealand. From there I went to Cambridge University, UK, for my PhD. I researched seed dispersal and gibbons in Indonesian Borneo, under David Chivers. I returned to New Zealand for a postdoctoral position. In 2003, my husband and I moved to India for his work. I initially had plans to begin a couple of research projects in India and Thailand, but pregnancy (and the subsequent baby!) made these plans a challenge. We don’t live in a city that has a strong (or any, really) network of researchers doing any work similar to what I was interested in. Hence, I had to choose between making a career change, being a largely-absentee mother, or focus on my children and fit my research around them. 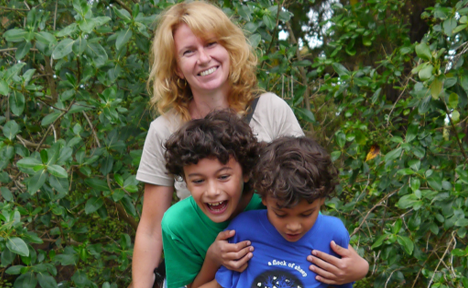 I chose to be available for my kids and become an independent researcher (in my spare time!). Before having my first child I had begun a collaboration with researchers working in Mahidol University and Biotec in Thailand. They were very supportive of a researcher-mum and this enabled me to establish a long-term project with them. Over the last 12 years we have been investigating seed dispersal interactions in Khao Yai National Park, Thailand. As my children have got older and more independent, I have been able to increase the amount of work I can take on; I have recently initiated additional research collaborations in Malaysia – still focused on an overall theme of seed dispersal. Along with my own research, I have advised students (mainly PhD) over the years, and am also a Subject Editor for Biotropica. More recently, I am involved in a venture to conduct student workshops across tropical Asia on seed dispersal interactions. These types of activities allow me to keep up-to-date with what is happening, given I am unable to have my own research group. I am lucky in that I can afford to partially fund my research trips. I am also assisted partially by some of the collaborations I am involved in. Initially, I applied for research grants but the limitations of when and how often I could be in the field made this approach difficult. Now, I appreciate the flexibility I have and the lack of administration duties! If the financial obstacles can be overcome then these are significant advantages. Have you faced any difficulties because of the lack of an institutional affiliation? Especially with respect to funding, permits, or collaborations? At the start, especially, there were many problems with being an independent researcher, but these were also partly due to my priority of being available for my children. I was working from home, far from people who were doing similar things and I really missed having colleagues to discuss things with. These discussions are important for processing new ideas and finding solutions to problems. Because of financial constraints I would conduct research once or twice a year, and I was reluctant to travel to other cities regularly for “colleague-contact” due to family constraints. Over the years the situation has improved as I have built up a reasonable network of supportive and stimulating colleagues and friends. As my children have got older and finances have become easier I am also able to travel a bit more. If I had been able to devote more time to managing field projects, I feel confident that funding could have been obtained for major research ideas – with the help of collaborations. However, funding for scoping projects and general equipment would probably have been difficult to obtain through the options available. These are often borne by the work institute and are not available to independent researchers. Being an independent researcher has not been a problem in forming collaborations. Having these collaborations has meant that obtaining permits has been straightforward, so far. Yes – I am certain it has made the processing of research permits more straightforward. These positions also have a positive impact on morale! It is nice to belong “somewhere” and also helps in building a network of colleagues. I didn’t make the decision to do this based on finances and it certainly isn’t a stable choice for me. However, I do know people (generally without families, and in regions where contract work is available) who can dedicate sufficient time and effort to making a career of independent research. In all of these cases I have noticed it takes considerable time – usually on a very limited income – to build a career. I can really only offer advice to people in situations similar to mine – where the decision to work independently is due to family constraints: figure out how much time and finances you can devote to your career and work persistently within these boundaries. To build a colleague and work base, say “yes” to any work, which connects somehow to your skill-base – even if there does not seem to be any immediate benefit for you. Over time this can build respect and a network of people who could help you build a career.